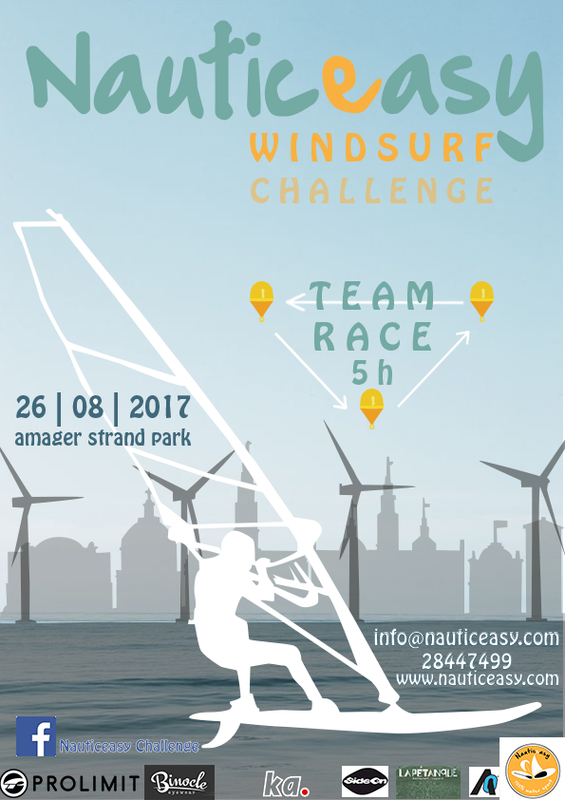 We organize the second edition of windsurf & SUP Nauticeasy Challenge. Its open to amateurs and professionals, children and adults (12 years old minimum). It’s a 5 hour team race with a specific route signalized with bends and your team has to ride as many tours as possible within these 5 hours. The team that obtains most tours win the race! It will take place in the bay of Amager Strandpark the 26. of August from 12 o’clock. You can register your team for 250 dkk with a minimum of 2 people to a maximum of 5, the minimum level is to be able to ride upwind. It’s possible to rent all the material if needed. The team can organize their running order and their performance as they want, as long as they follow the route. There will be a lot of PRIZES to win from our partners. Families, friends, supporters and pass-byers are invited too. In front of the bay, there will be food, an alcohol-free bar, a small stage with music and a tombola. There will be prizes to win at the tombola for a 25kr ticket and the raffle starts from 15:00 and choose a winner every 15 minute! Many price to win from all our different partners. We will be moving around the coast with equipment for you to rent. Check out our Facebook pages below and follow to find out where we are this summer.